Am I the only one who seems to continuously clean? I mean, I clean my bathroom during the day and by the time the kids are in bed after bath time it’s like I never cleaned it. The worst of it is my floors. I can vacuum our main floor in the morning and by the time the kids are sitting down for dinner, I can see things on the floors that make me want to take out that vacuum again. Since I’ve become our home’s personal Molly maid, I’ve tried my own fair share of Ecofriendly products. I’ve also attempted many do-it-yourself recipes. Today I thought I would share some of my favourite homemade cleaning recipes that I use to clean my home. I mainly use baking soda and vinegar to clean most things ie toilet, bathtub, kitchen sink. Works wonderfully. I scrub with the baking soda and then rinse with water. I spray with vinegar to get rid of the residue. Baking soda works amazingly to rid the bathtub of the ring it frequently gets from our kids baths, joyously just need a little elbow grease. Take the vinegar and put it in a spray bottle. Microwave the vinegar until it is quite hot. Add the dish detergent, cover, and shake. That’s it! How simple is that? note that this does not need to be reheated each time. Once it’s ready spray it on your shower tiles and let it set for a while. I usually wait 15 to 30 minutes. Then with a wet cloth wash it off. Smells great and works wonderfully on soap scum. 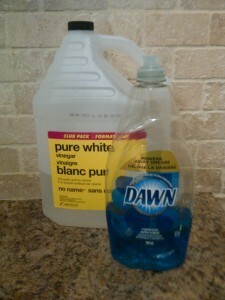 The next good household cleaner I use is this one one for my floors. I use it on my bathroom and kitchen floors. In a bucket, mix all ingredients. Use a mop and clean your floors. Now if now if only I could find a good hardwood floor cleaning recipe, I’d be set. Any suggestions?